We are almost at the end of the first quarter of 2019 and what a time of possibilities and real action. 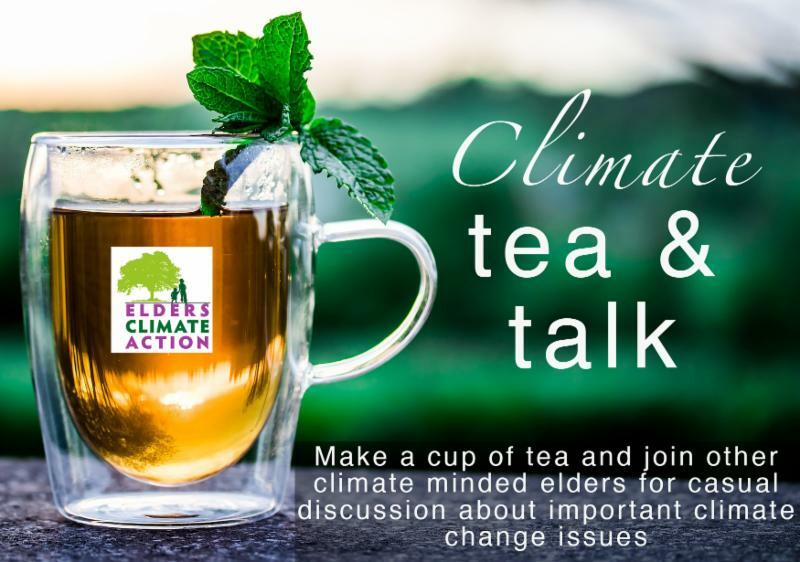 Elders Climate Action has made its 2019 top priority that of collaborations. We will deepen our relationships with other organizations and support their goals by amplifying our voice, the voice of elders. We are the elders who were the youth of the 60’s and 70’s and we have learned that our idealism did not take hold most likely due to the lack of elder leadership and wisdom. Now we are the elders with the wisdom and we can support the youth in their vision for a better society. So what does that mean for you? Support the youth movements in their vision for a Green New Deal, support Citizens Climate Lobby in their Energy Innovation and Carbon Dividend Act, make your voice heard. Call and write your federal, state and local legislators and let them know these are policies elders support and that you are a part of a movement of elders. There is not a great deal of time so take action now. Read our newsletter and find one action you would like to take and do it now. "To my great great grandchildren"
or the price you must pay. as the web of life unspun. and try to save this world....for you. We will share your letter now and preserve your letter for the future. 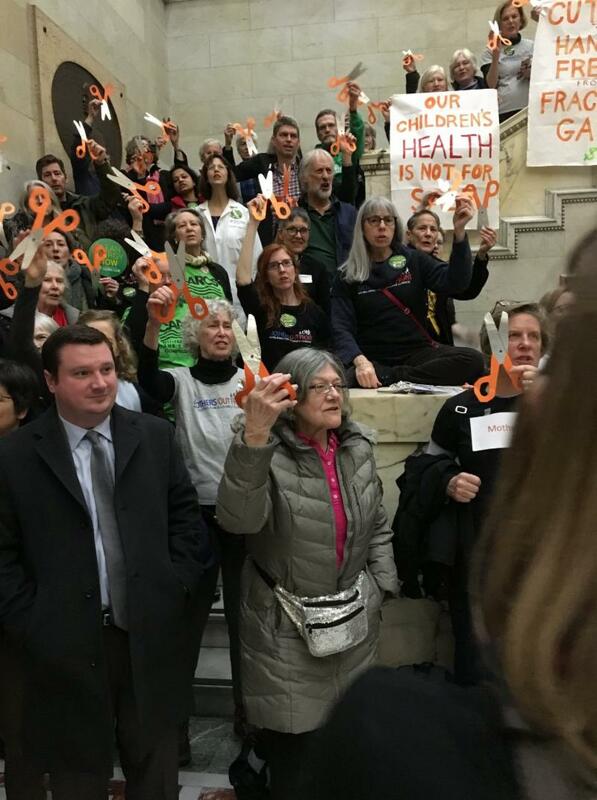 In February the Massachusetts chapter joined a protest at our capitol organized by Fore River Residents Against the Compressor Station and Mothers Out Front. These groups were protesting the proposed natural gas Compressor Station in Weymouth. Partnering with these groups gave our members an easy way to take action and strengthened our relationship with them. Mothers Out Front, which—like ECA—targets a particular demographic, offered mentoring to us on ways to collect data on our actions. Gathering outside the governor’s office for speeches, we were especially inspired by a young mother who has spent her lunch hours there since 2017 protesting a previous health impact assessment that understated the risks of the Weymouth station. We then delivered 93 letters from community health boards calling for Comprehensive Health Impact Assessments for any expanded or new fracked gas infrastructure. As Elders, we’ll continue to show up, stand up, and raise our voices to preserve a livable climate for future generations. 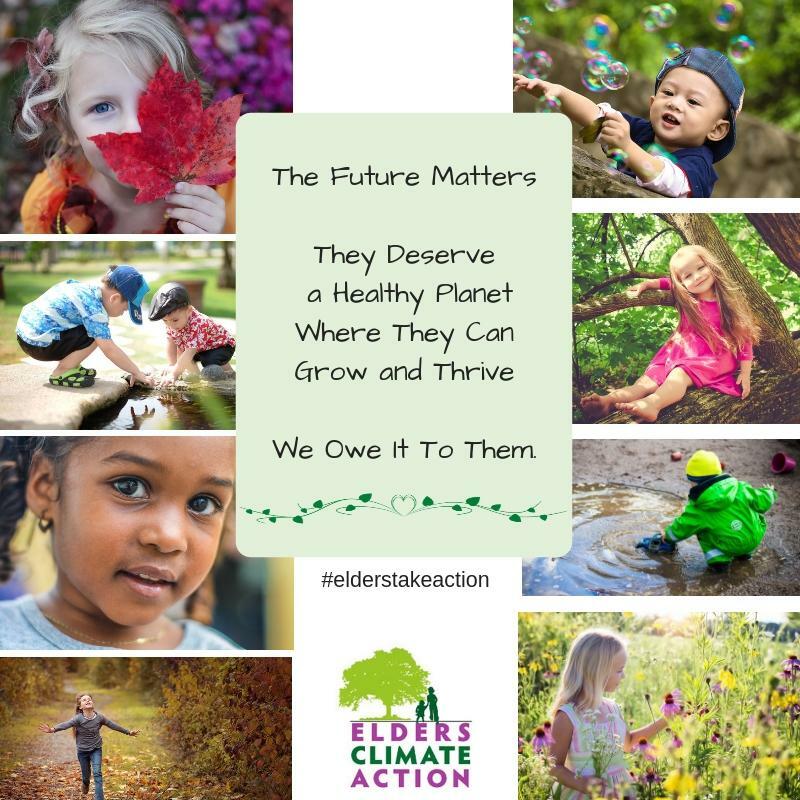 For the second year, the Arizona Chapter of Elders Climate Action was one of approximately 30 Arizona groups to co-sponsor Environmental Day at the Arizona Legislation to celebrate Arizona’s 107 th Birthday. This year’s theme was “Five Cs for a Sustainable Future and was attended by over 400 people of all ages, including many elders. This was an amazing opportunity to bring a diverse group of advocates together to ensure that Arizona has many more healthy birthdays. The five Cs include: Climate Preparedness, Clean Air and Water, Conservation of Lands, Water and Wildlife, Commitment to Efficient and Renewable Energy, Cultural Inclusiveness and Diversity. Legislative leaders spoke on the need for immediate action followed by multi-generational teams meeting with most of the State Senators and Representatives. The urgency of action was paramount in these conversations. Key to the impact was Elders and high school students addressing the urgency of action on these critical issues. 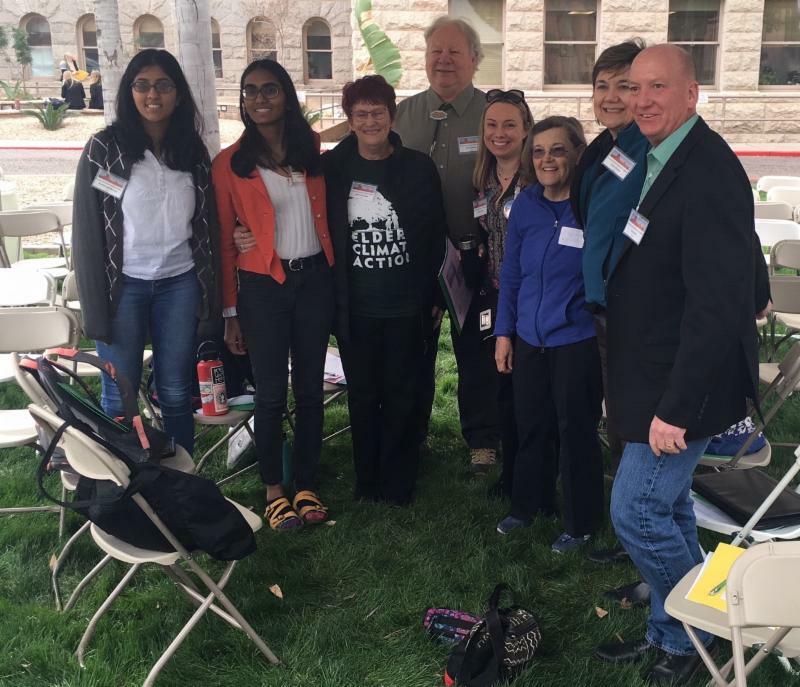 Right:Turn out for Arizona Environmental Lobby day. Above: ECA member Hazel Chandler with lobby team. The words of this young woman are powerful beyond measure. We hear you Greta, we are listening and we will continue to push for action on climate change. 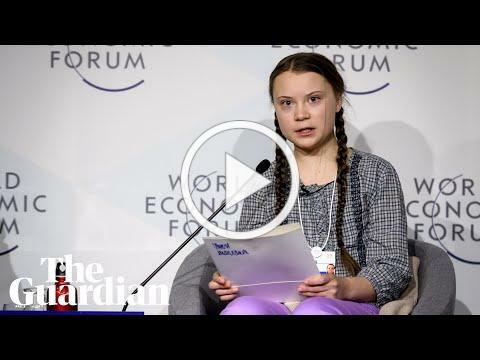 If you haven't heard Greta's recent speech at DAVOS, watch it now. THEN, TAKE ACTION today and everyday, "like the house is on fire." Elders Stepped Up in 2018! 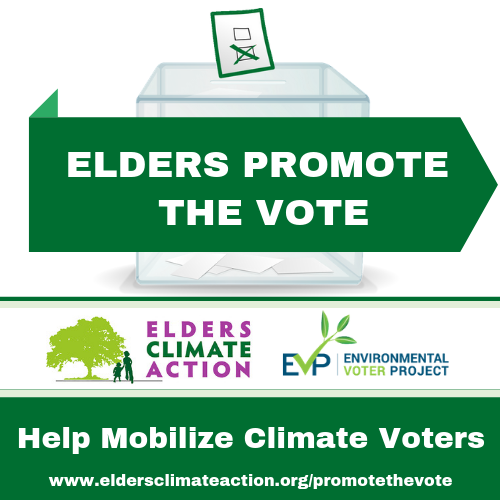 During the 2018 elections, Elders Climate Action partnered with EVP to get out the vote. We conducted “Get out the Vote” efforts in Colorado, Florida, Georgia, Massachusetts, Nevada, and Pennsylvania, reaching more than 130,000 registered voters. Early research shows that our GOTV efforts were effective in increasing voter turnout. 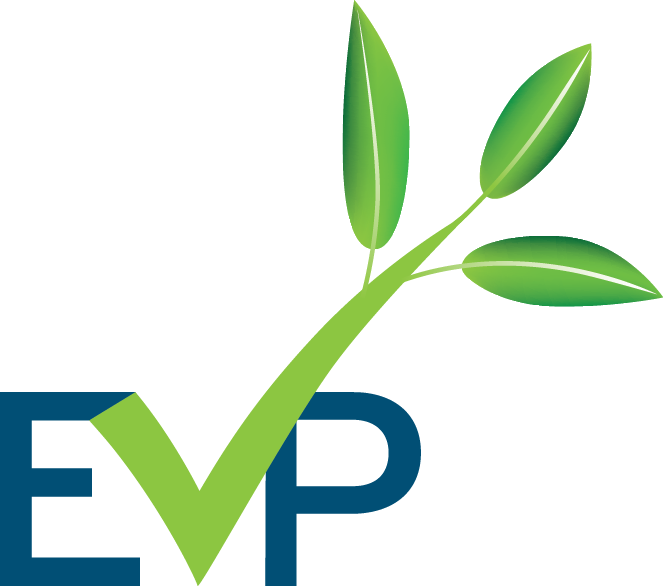 Our efforts in the 2018 elections resulted in thousands of pro-environment votes, and we are scaling up to have a much larger impact in 2020. A recent analysis of nation-wide elections shows that over 15 million individually identifiable environmentalists have stayed at home on Election Day. Therefore, the key to getting powerful environmental policies in place might not be to persuade more Americans to be environmentalists; it may be as simple as getting more of our existing environmentalists to vote. You can be key in getting out this vote from the comfort of your home or, depending on where you live, in your own neighborhood. Please join us on a training web-call for prospective volunteers on March 19 at 6:00 PM Eastern Time. 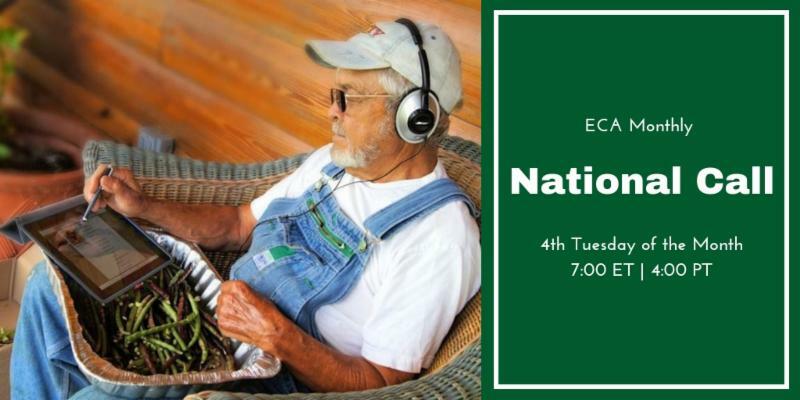 By joining this call you'll get in on the ground floor of building our national Elders Promote the Vote initiative and forming state and local teams. You can be key in getting out this vote from the comfort of your home or, depending on where you live, in your own neighborhood. Join us March 19 at 6pm Eastern Time to find out how you can be part of the “Elders Promote the Vote” effort. The new EPA Administrator Andrew Wheeler has announced that the EPA will begin to undo the Mercury and Air Toxics Standards. 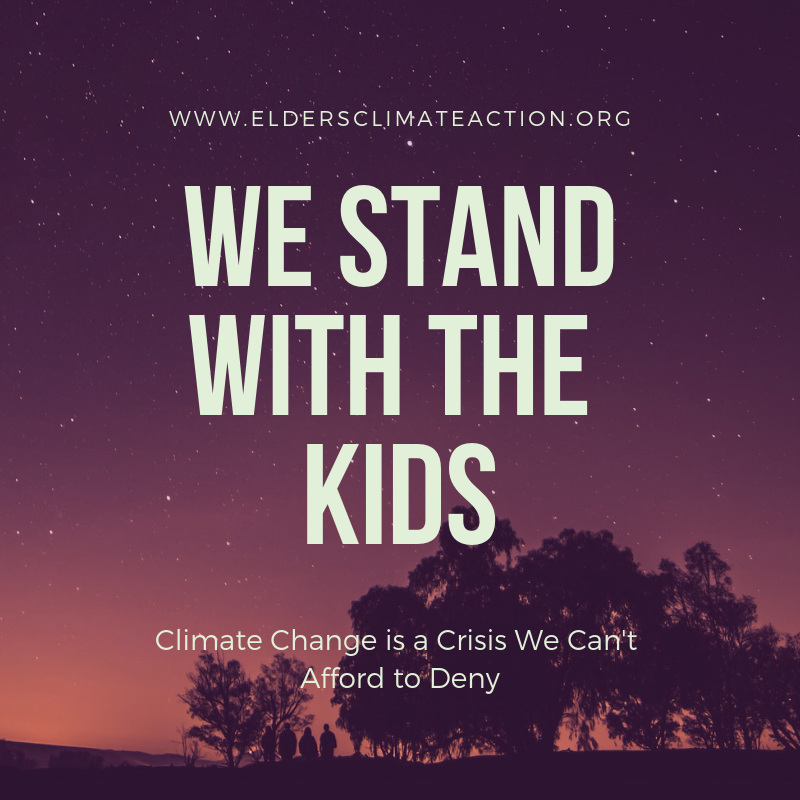 ﻿ Stand with Elders Climate Action and our partner Mom’s Clean Air Force today by sending your message denouncing this action to Acting Administrator Wheeler — we’ve made it easy for you to send your message to both Congress and EPA at once! Submit a comment in the Federal Register. Comments must be received on or before April 8, 2019. National Emission Standards for Hazardous Air Pollutants: Coal- and Oil-Fired Electric Utility Steam Generating Units-Reconsideration of Supplemental Finding and Residual Risk and Technology Review . 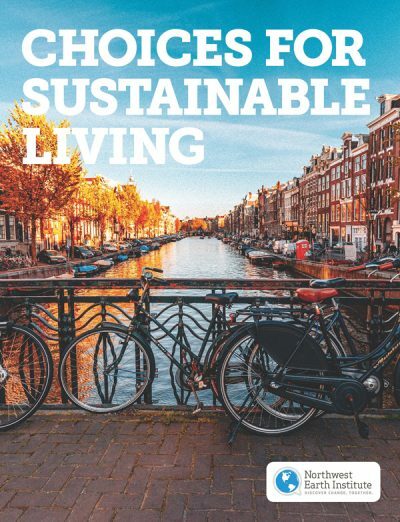 Janet McCabe will speak on the theme of " The Past, Present and Future of Environmental Protection: Threats and Opportunities"
Participants will need to purchase " Choices for Sustainable Living 2018"
from Northwest Earth Institute .